Easter Sunday does not commemorate the resurrection! Christ did not die on Good Friday! Here's proof of the true dates of the crucifixion and the resurrection. Either the Good Friday-Easter Sunday tradition is a fable, or you have no Savior! Jesus gave only one sign to prove that He was the Messiah, and that sign was the length of time He would be dead and buried. Notice Jesus' own words concerning the only sign that would prove His Messiahship: "An evil and adulterous generation seeks after a sign, and no sign will be given to it except the sign of the prophet Jonah. For as Jonah was three days and three nights in the belly of the great fish, so will the Son of Man be three days and three nights in the heart of the earth" (Matt. 12:39-40). If Jesus did not fulfill that sign, then He was an impostor and you are without a Savior! Of course, theologians and scholars deny that Jesus fulfilled this sign. They say He was in the heart of the earth only one day and two nights — half as long as He said He would be! And in so doing they deny the only proof Jesus gave that He is the Messiah, the Savior of the world. "But there were also false prophets among the people [in Old Testament times], even as there will be false teachers among you [Christians], who will secretly bring in destructive heresies, even denying the Lord who bought them... and many will follow their destructive ways" (II Pet. 2:1-2). The many are today denying 13 their Savior by believing a tradition that rejects the only sign Jesus gave to prove He is the Messiah. Did you know that it was not until after the death of John, the last of the 12 apostles, that the Good Friday-Easter Sunday tradition began to spread through the churches? How long dead and buried? Let's examine Jesus' own words, recorded in the gospels, to find out if He meant what He said about the sign of Jonah. Did Jesus really expect to be buried in the earth for three days and three nights? Notice Mark 8:31: "And He began to teach them that the Son of Man must suffer many things, and be rejected by the elders and chief priests and scribes, and be killed, and after three days rise again [from the grave]." Did you grasp that? Jesus did not say " after a day and a half." Jesus said "after three days." Consider: If Jesus were crucified and buried late on Good Friday, then one day after would be Saturday evening, two days after would be Sunday evening and three days after would be Monday evening. But Jesus rose long before Monday evening. Either Jesus was not crucified on Good Friday, or He did not fulfill His sign and He is therefore an impostor and not the Messiah. Did Jesus fulfill His sign? Turn to Matthew 28:6. Here is the testimony of the angel: "He [Jesus] is not here; for He is risen, as He said." Jesus did fulfill His sign exactly. He is the Savior. Then He could not have been crucified on Good Friday! But this is not all. Turn to John 2:19, 21: "Jesus answered and said to them, 'Destroy this temple, and in three days I will raise it up. "... But He was speaking of the temple of His body." If Jesus were crucified and had died on Friday afternoon and would have been resurrected on Sunday morning, the temple — His body — would have been raised in a day and one half. But Jesus did not say it would occur in a day and one half. Not even in two and one half days, but in three days' time — 72 hours. In other words, three 24-hour days after His death, He would be made alive again as immortal spirit by a resurrection. Jesus meant exactly what He said. But Jesus also declared He would rise the third day. Let us suppose again that Jesus was crucified on Friday. If He were to rise on the first day after His crucifixion, He would be raised on Saturday — if on the second day after His crucifixion, He would rise on Sunday. But if He were to rise on the third day, He would have been raised on Monday. But Jesus was already resurrected by Sunday morning. Plainly, Friday was not the day of the crucifixion! Adam Clarke, for example, in his commentary on Matthew 12:40, quotes the Talmud in support of the idea that three days and three nights supposedly mean one day and two nights. The Seventh- day Adventist Commentary implies the same. But the Bible is not interpreted by the Talmud or by a human commentary. Jesus rejected the traditions of the elders. 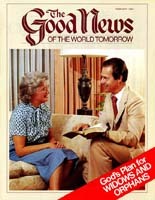 The Review and Herald, the official publication of the Seventh- day Adventists, listed several texts that, they claim, indicate that three days means no more than a day and one half. Let's look to see if Scripture supports these claims. Here is the first text they offer as "proof" that "after three days" does not mean after three days! King Rehoboam told the people who came to meet him, "'Come back to me after three days.' And the people departed" (II Chron. 10:5). The same event is quoted in I Kings 12:5: "Depart for three days, then come back to me." The story continues with verse 12: "So Jeroboam and all the people came to Rehoboam the third day, as the king directed, saying, 'Come back to me the third day.'" The people left "for three days" and did not return until " after three days," as the king had appointed. Let us suppose they had first met the king sometime on Friday. As they were ordered to return at the end of three days, they would not have returned before the same time of day the following Monday. Now was Monday "the third day" from the day they had originally met with the king? The first day from that Friday was Saturday, the second day from that Friday was Sunday and the third day was Monday — exactly the time the king expected them to return. Monday, not Sunday, was the third day from Friday. The next text offered as "proof" that "three days and three nights" means only one day and two nights is Esther 4:16 and 5:1. "Fast for me," said Queen Esther, "neither eat nor drink for three days, night or day. My maids and I will fast likewise. And so I will go to the king." "Now it happened on the third day that Esther put on her royal robes" and went to the king. Which day was this? The third day of the fast. Suppose Queen Esther had requested the Jews late Friday evening, shortly before sunset, to fast. The first day of their fast would have been Saturday, the second day would have been Sunday and the third day, Monday, the queen would have entered the king's palace. Isn't that plain? The Jews did not fast parts of three days, but three days, night and day. Notice that in each of these examples, three days means three days, not parts of three days or only a day and one half. What day was the crucifixion? Jesus died some three hours before sunset on the day of the crucifixion (Luke 23:54). Since Jesus said that He would rise the third day after His crucifixion and death, it is obvious that He was made alive by a resurrection precisely at the completion of the third day following His death. When the women came to the tomb early Sunday morning, Jesus had already risen. The angel said: "He is risen! He is not here" (Mark 16:6). Of course, Jesus had been resurrected the previous evening. Jesus arose from the dead late Saturday afternoon — He was not at the sepulcher Sunday morning. Three days before Saturday afternoon would place the crucifixion on Wednesday, the preparation day for the Feast of Unleavened Bread. Thursday of that year must have been an annual Sabbath, the first annual Sabbath in the Days of Unleavened Bread. So that we would know that the Sabbath that followed the crucifixion was not necessarily the weekly Sabbath, John was inspired to call it a "high day" (John 19:31), which, according to Jewish usage, means an annual Sabbath that may occur any day during the week. Mark picks up John's account by adding that after that Sabbath, which was a high day, the first day of the Feast of Unleavened Bread, the women bought sweet spices to use in anointing the body of Jesus (Mark 16:1). This purchasing of the spices could not have been on Thursday, the annual Sabbath. It must have been Friday. Having made their purchases, the women prepared these ointments and "rested on the Sabbath according to the commandment" (Luke 23:56). This was the seventh-day Sabbath upon which, near its close, Jesus was raised from the dead. Thus the Bible proves that the resurrection was not on Sunday morning, the crucifixion not on Friday. There were two separate Sabbaths that week, one an annual Sabbath, the other a weekly Sabbath. A text indicating that there were two Sabbaths in that week has been obscured by almost every translation into English. Only Ferrar Fenton's version has this point correct. Turn to Matthew 28:1. In the common versions it says, "in the end," or, more correctly, "after" the Sabbath. Notice now the singular Sabbath. But in the original Greek the word is in the plural. Fenton renders it correctly by saying, "after the Sabbaths." In a footnote to this text, he says, "The Greek original is in the plural, 'Sabbaths,' which is retained." Another verse referring to Jesus' departure from the tomb after His resurrection from the dead is Mark 16:9. This verse does not prove the resurrection from the grave was on a Sunday morning. In the original Greek the phrase "early on the first day of the week" refers to the early part of the day — the evening — for a day began at sunset. Jesus was risen from the tomb early the evening before Sunday morning. That is, He was already risen Saturday night. That was three days and three nights after His burial and the closing of the tomb. We read in the Revised Standard Version, which has the correct translation of Luke 23:54: "It was the day of Preparation, and the sabbath was beginning." That is, it was very late on the preparation for the Feast, or first annual Sabbath, and the new high day Sabbath had already just begun as Joseph of Arimathea finished the burial. It was the so-called apostolic fathers, steeped in traditions, who first began to teach that the crucifixion occurred on Friday. Yet they admitted that the ancient custom of fasting on Wednesday — the actual day of the crucifixion, as we have seen — was derived from "the day on which Jesus was betrayed" and "on which the Sanhedrin decided to kill him" (Schaff-Herzog Encyclopedia of Religious Knowledge, "Fasting")! These same men soon attempted to change the year of Jesus' birth — the year that He began His ministry — the length of His ministry — the days of His death and His resurrection from the dead. Astounding proof exists of these attempts to change the days of the resurrection and of the crucifixion. James A. Walther, in an article entitled "The Chronology of Passion Week," in the Journal of Biblical Literature, mentions that numerous Catholic writers for centuries maintained that Jesus ate the Passover Tuesday night — that early Wednesday morning He was taken by the Jewish mob. Mr. Walther declares: "References in the Didascalia, in Epiphanius, in Victorinus of Pettau ... support the Tuesday [night] Passover dating and the subsequent arrest of Jesus in the morning hours of Wednesday." One of the first post-biblical attempts to explain the day of the resurrection from the dead late Saturday to the hours of Sunday morning occurred in the spurious "gospel of Peter," which was probably circulated from Rome about the time of the death of the apostle John. This "gospel" reads as follows: "And then they drew out the nails from the hands of the Lord, and laid him upon the earth... and the Jews rejoiced, and gave his body to Joseph that he might bury it.... And he took the Lord, and washed him, and rolled him in a linen cloth, and brought him into his own tomb.... And I with my companions were grieved; and being wounded in mind we hid ourselves ... and upon all these things we fasted and sat mourning night and day until the Sabbath. "But the scribes and Pharisees and elders being gathered together one with another... came to Pilate, beseeching him and saying, Give us soldiers, that we may guard his sepulchre for three days, lest his disciples come and steal him away.... And with them came elders and scribes to the sepulchre, and having rolled a great stone together with the centurion and the soldiers, they all together who were there set it at the door of the sepulchre; and they affixed seven seals... and guarded it. And early in the morning as the sabbath was drawing [dawning], there came a multitude from Jerusalem and the region round about, that they might see the sepulchre that was sealed. "And in the night in which the Lord's day was drawing on... the tomb was opened" — and Jesus was already risen — He was not there (from the Ante-Nicene Fathers, volume 10, pages 7-8). Notice! Between the crucifixion and the Sabbath, the disciples and Peter are said to have fasted "night and day until the Sabbath." This alone is a candid admission that the crucifixion was not on Good Friday! It was decades later before the idea of a Friday crucifixion and a Sunday morning resurrection was widely believed. The apostle Paul called Jesus Christ our Passover (I Cor. 5:7). According to the gospel records, Jesus was crucified on the Passover day — Abib (or Nisan) 14 — immediately before the Feast of Unleavened Bread. Which day was the Passover? On the eve of that 14th of Abib, after sunset, Jesus instituted the New Testament Passover. By custom that day was also a day on which all leaven was finally removed and only unleavened bread was to be seen in the homes (Luke 22:7-8). See also John 18:28 as proof that day was Passover, Nisan 14. The Jews and Jesus and the apostles agreed as to which day it was. There is no question about the date. But how did the Jews know which day it was? How did Jesus and the apostles know that this was the Passover day as God had appointed it? By God's calendar, of course! The Passover was the 14th day of the first month according to the sacred calendar used by Jesus and the Jews. 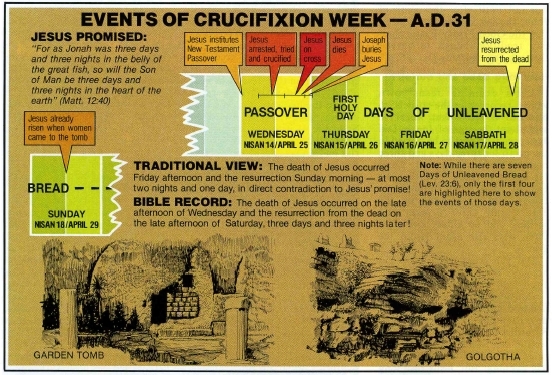 By that calendar we can know precisely which day the Passover was in the year of the crucifixion! It is the Jews to whom God committed His revelations or oracles. Paul declared: "What advantage then has the Jew?... Chiefly because to them were committed the oracles of God" (Rom. 3:1-2). The oracles of God included the Old Testament Scriptures, the knowledge of the week and of the sacred calendar. The Jews preserved for the world the knowledge of which day the seventh day of the week is. Without a knowledge of when a week begins and ends, we could never have told from the Bible alone which day the seventh day actually is. No nation preserved the week properly until they learned it from the Jews! And in the same way the Jews have preserved God's calendar. "But," you ask, "what if some Jews did not believe in the oracles of God — including the sacred calendar — that were committed to them? Did they lose them or corrupt them?" The Bible gives us the answer plainly in verses 3 and 4: "For what if some did not believe? Will their unbelief make the faithfulness of God without effect? Certainly not! Indeed, let God be true but every man a liar." If the Jews did not believe in what God committed to them — even if they lie about God's truth — they must preserve them or God has failed to be God! If the Jews have not preserved the sacred calendar since the crucifixion, then Christians would not know when to observe the Passover annually, or any of the other Holy Days of God commanded for New Testament times (I Cor. 5:8, 16:8, Acts 18:21, 20:6). For proof that the Passover is to be observed annually, not several times each year, read our free booklet How Often Should We Partake of The Lord's Supper? And for more information on God's other commanded Holy Days, read our free booklet Pagan Holidays - or God's Holy Days - Which? God has required the Jews to preserve His sacred calendar! Next month we will see the historical and calendrical proofs that the Good Friday-Easter Sunday tradition is a fable that denies Jesus to be the Savior!